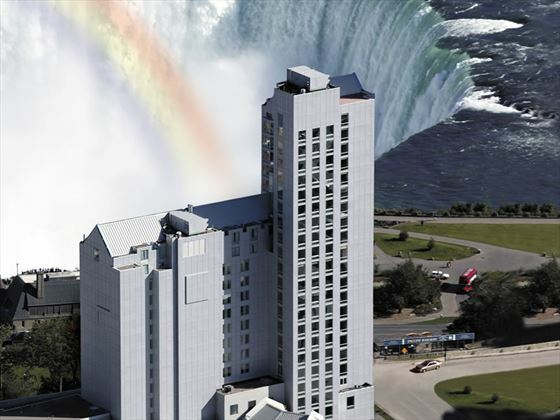 The Oakes is the closest hotel to the Horseshoe Falls - Niagara’s largest, most beautiful waterfall. 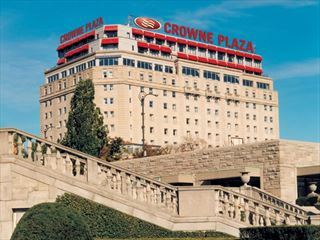 Located in the heart of the Fallsview tourist area, The Oakes Hotel is also right next door to the brand new Niagara Fallsview Casino - a multi-faceted casino complex featuring a lavish Las Vegas style theatre, convention facilities, large shopping arcades, spectacular gaming areas and more. 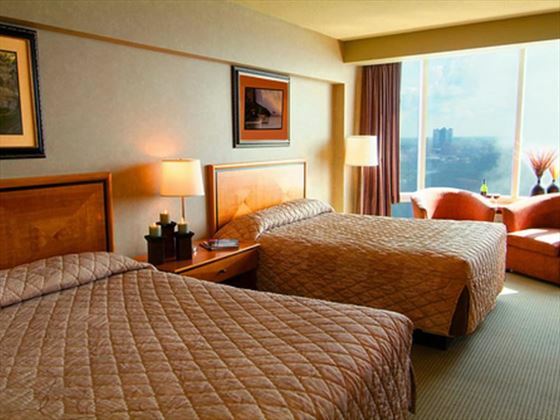 The hotel’s rooms and suites combine the finest comforts with the most modern, sought-after amenities. 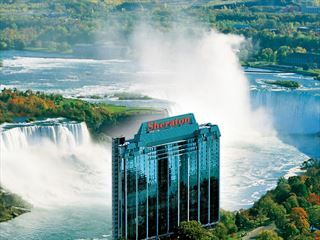 Overlooking beautiful Niagara Falls, The Oakes Hotel in Niagara Falls offers the best views of the Falls from the Fallsview hotel rooms, guaranteed. 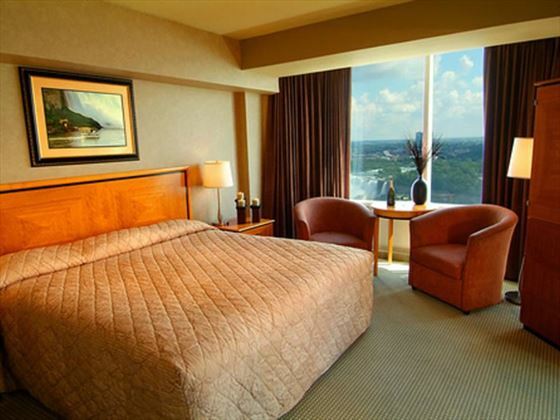 All guests of The Oakes Hotel can take advantage of the 14th floor observation level with floor to ceiling windows, and comfortable seating Overlooking Niagara Falls. 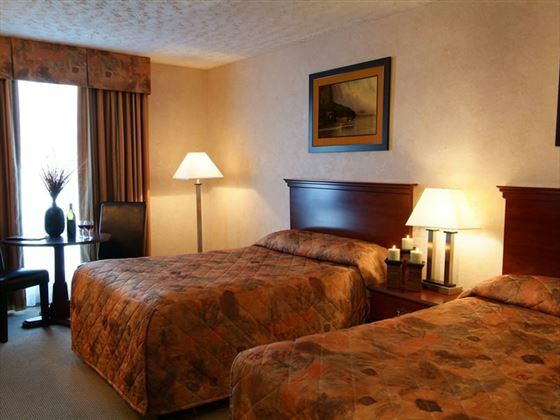 2 Queen Bed Fallsview Room - Overlooking beautiful Niagara Falls, this room is located on floors 9 through 12 and includes two queen size beds, satellite TV, an iron and ironing board, alarm-clock radio, designer amenities, and pay per view movies. 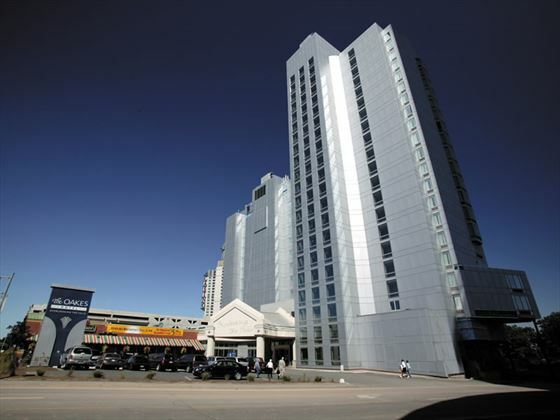 A selection of Fallsview Suites are also available. 2 Queen Bed Falls-Side Room - This stylish room is located on floors 2 through 8, with floor to ceiling windows facing towards the Falls. 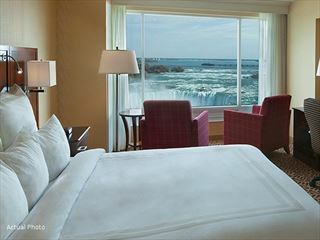 From this room you’ll have a view of the crest of Niagara Falls, and the Niagara River. This room includes two queen size beds, a sitting area, designer amenities, iron and ironing board, satellite TV, radio alarm clock, hair dryer and pay per view movies. A selection of Falls-Side Suites are also available. Conveniently attached to The Oakes Hotel, Applebee’s Neighbourhood Grill & Bar offers breakfast, lunch, dinner and late night snacks. This family favorite has a menu to please any palate, with signature steaks and ribs a speciality. "The Perfect Margarita" is featured in Applebee’s friendly bar, and full room service is available while staying at The Oakes Hotel. Guests of The Oakes Hotel Overlooking the Falls are cordially invited to enjoy Niagara’s Finest Steak & Seafood at our associate restaurant, the award winning Remington’s of Niagara. 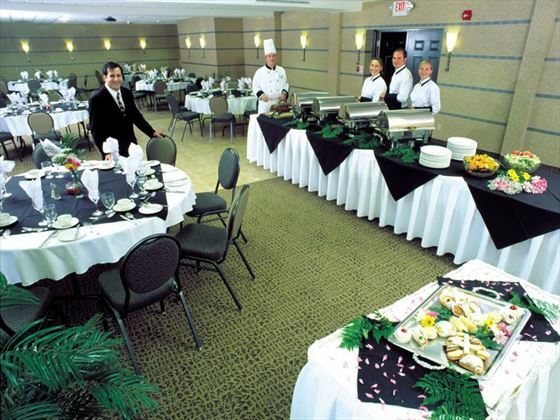 The restaurant is located in the heart of the tourist district across from Casino Niagara. Free shuttle service (subject to seasonal availability) from the hotel is available. Located one block away from the Oakes Hotel, Perkins is definitely your best choice for a breakfast you’ll never forget! From omelets to benedicts to simple yet delicious egg breakfasts, Perkins has something for everyone. Perkins also features great lunch and dinner food with daily specials that are un-beatable. Free shuttle service is available from The Oakes Hotel (subject to seasonal availability).